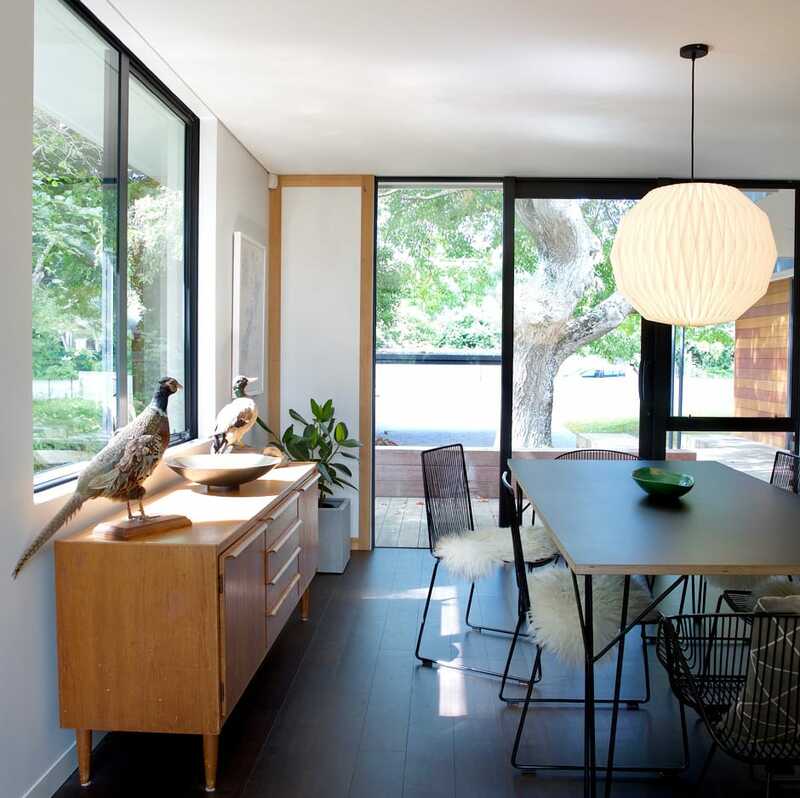 The designers of this detail-oriented Greytown home put absolutely everything into it. 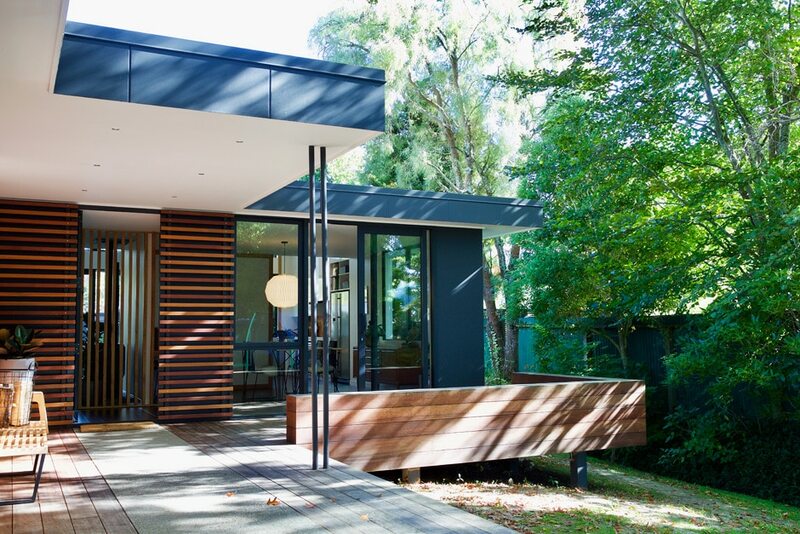 ABOVE Extended to level off the existing home’s ‘L’ shape, the front of the house is clad in dark Titan panels and cedar in a mix of blonde and warmer tones. In actual fact, their project’s steady pace was quite deliberate. Architectural designer and builder James has always been an old soul. With an affinity for the objects and ideals of eras past, he values heritage and craftsmanship, quality over quantity, and focused over fast and furious. 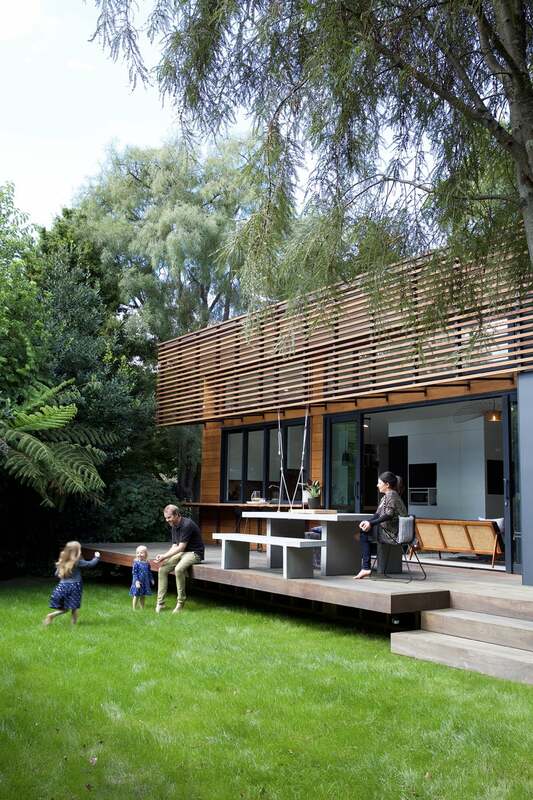 TOP Recycled rimu slats separate the dining and living areas from the entryway and provide privacy for an office nook. The couple use their Portobello and Devonport dining chairs from Ico Traders inside and out; the powdercoated wire looks great with the concrete table and benches on the back deck. ABOVE The matte black tabletop the couple made, chairs and Stand table legs by Ico Traders, and Opus flooring by Karndean all tie in with the inky accents in the kitchen. The Large Seed pendant light is by Juliet Black of Blacklight. 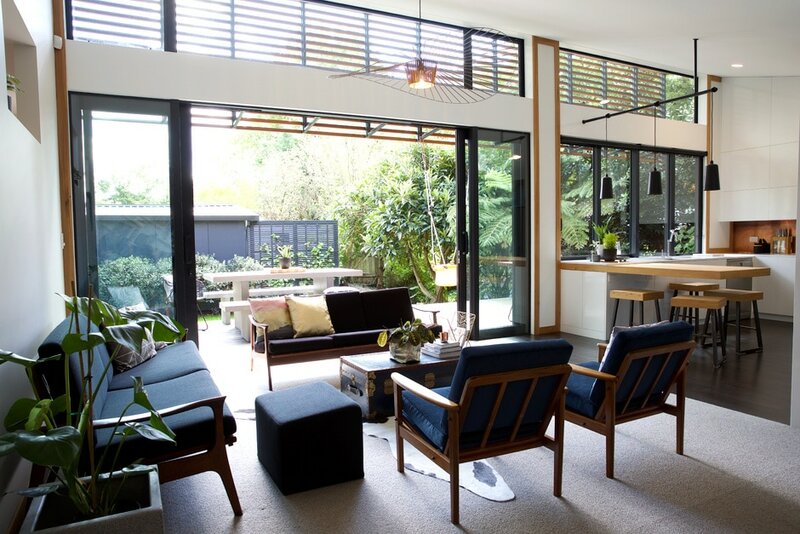 The five-year renovation of their 1960s home drew on modernist architectural principles, from an influential period in which James says “the world was able to deal with things taking a bit longer to be done to a higher level” and many architects paid attention to every aspect of a home, “from designing joinery and built-in furniture, to choosing the furniture and paint colours”. 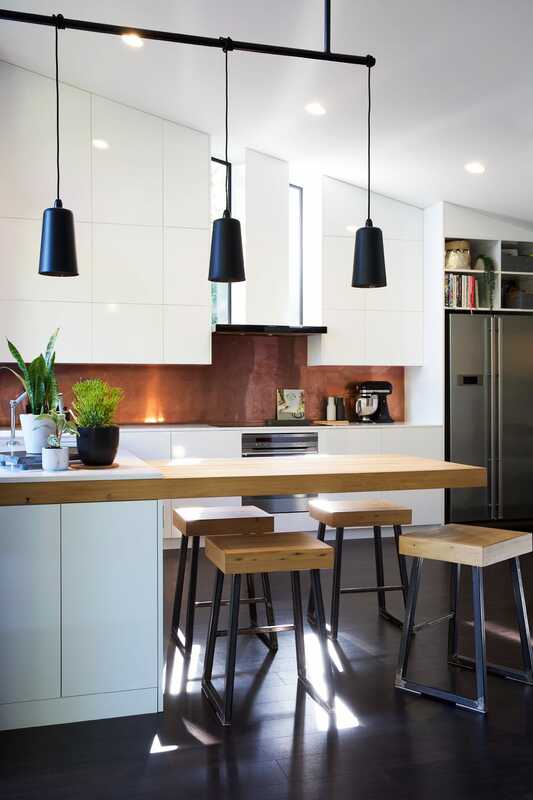 ABOVE Highlights in the new kitchen include the custom copper splashback James made and the pendants from Città. 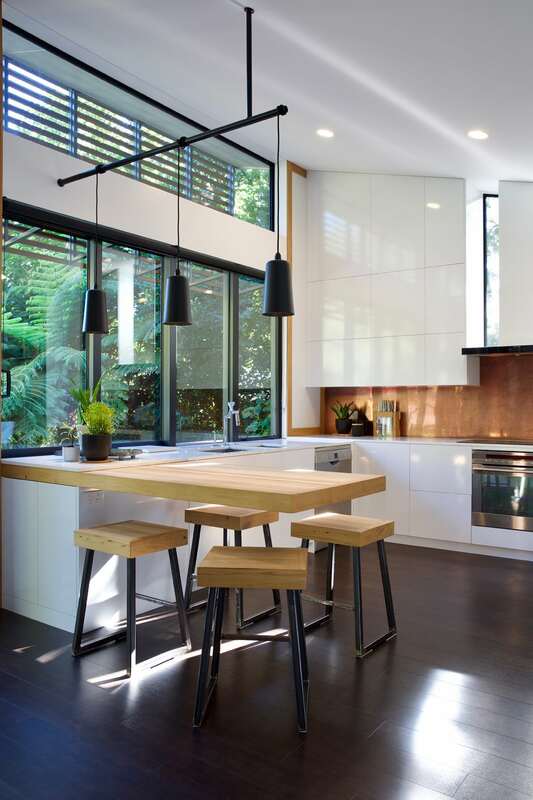 Custom-made stools sit under the cantilevered rimu bench, which the couple designed so they can gather around it like a table, “unlike an island or a breakfast bar, where you all face one way”. Every aspect of their property received some TLC, with sustainable principles employed throughout in low-key but effective ways. 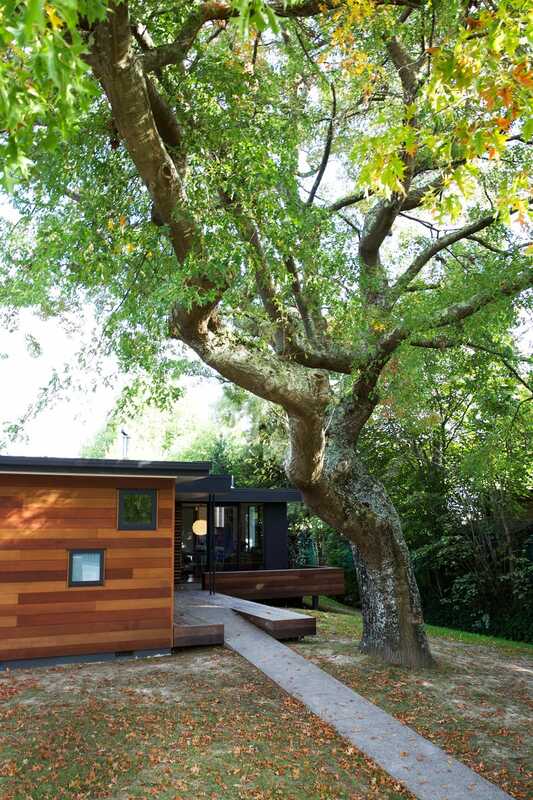 Each space is oriented for sun and shade, using the oak tree at the front of the house and cedar slats at the back to filter light, and prevent overheating in the summer while allowing the low winter sun to pour in. 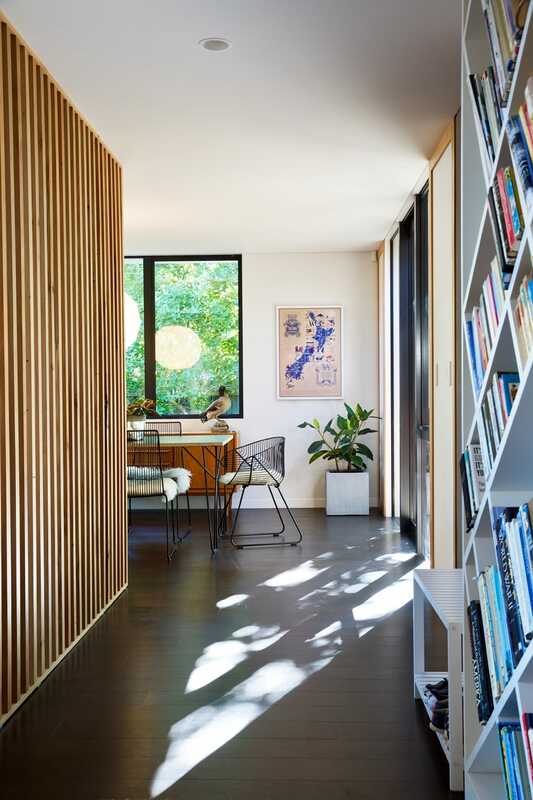 The elevated ceiling at the rear lets in more light (and a view of the Tararua Ranges), and three openings in the living room wall help to circulate heat. 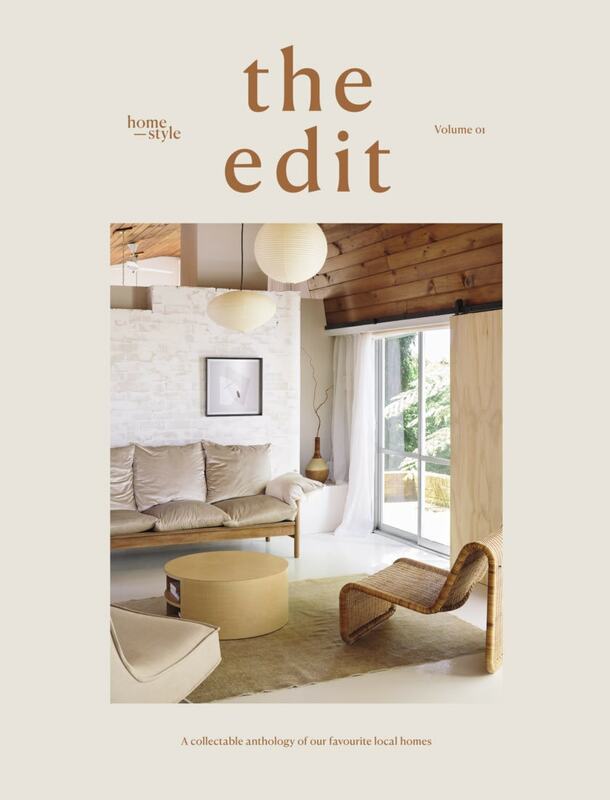 The expertly resolved details continue with windows in interesting shapes and configurations, and interior trim made from rimu recycled from the demolition. 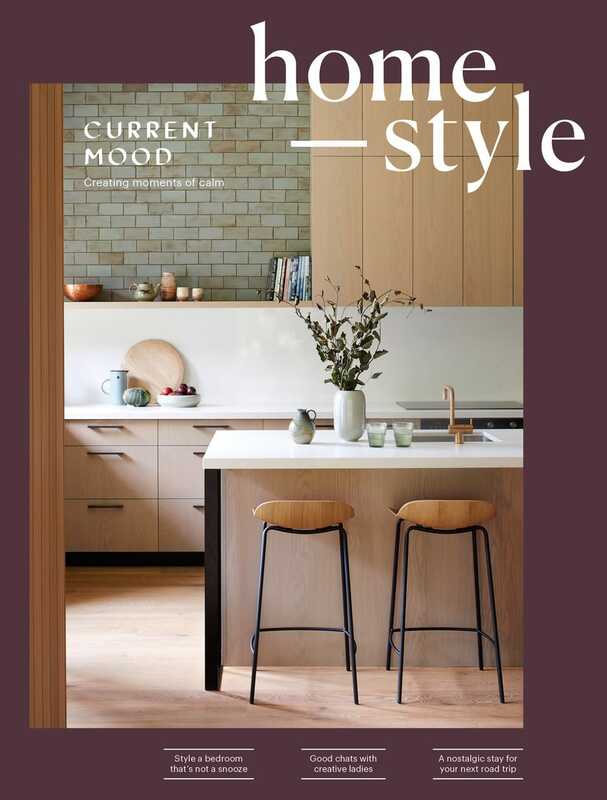 Board-formed to provide a timber texture, the cast-concrete front wall mimics the weatherboards, and the fireplace hearth is cast concrete too. 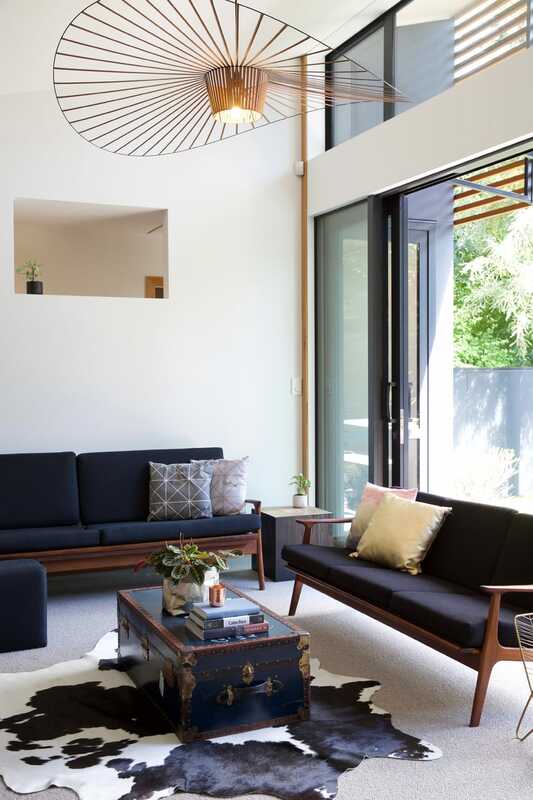 With plenty of texture in the cedar, rimu, concrete and copper heroes of the material palette, the couple kept the interior décor relatively neutral. Resene Black White on the walls contrasts with black, gold and sapphire accents throughout. 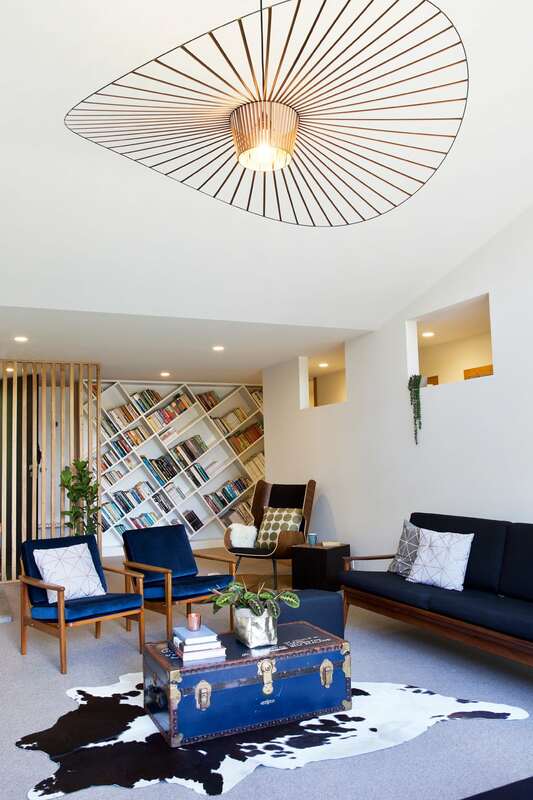 The main source of colour in the living area, the bookcase was designed to be like a piece of art, and the Vertigo pendant light by Petite Friture overhead has a similar effect, its copper ribbons echoing the visual language of the slat wall below. The furniture and homeware riff off pieces money can’t buy, like the mid-century sideboard that belonged to James’s late dad, plus the taxidermied trout, duck and pheasant he caught; the blue armchairs in the living area that were Susie’s grandparents’; and the chest from her mum’s boarding-school days. 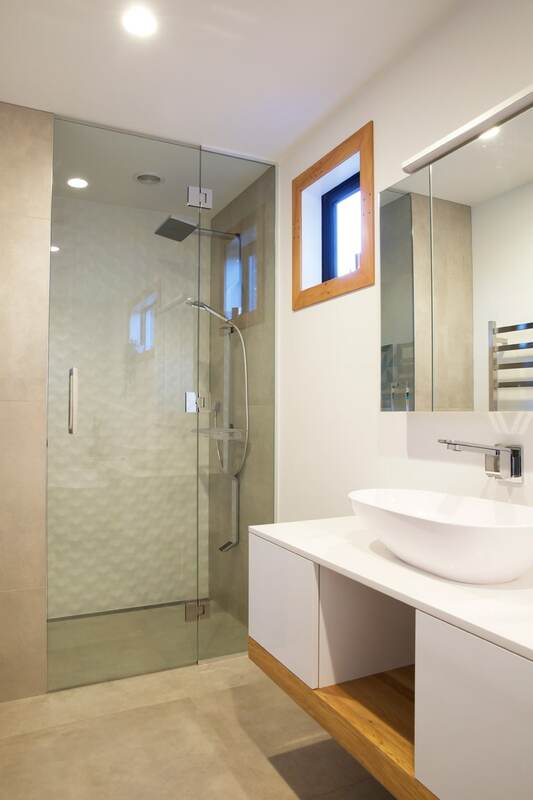 ABOVE In the main bathroom, the vanity was custom-made with a Ceasarstone Classico Pure White top, a recycled rimu shelf, tapware from Methven’s Tahi collection and an Egg vessel basin by Plumbline. The floor tiles here are Grafitti Corda Matt from Tile Space and on the walls, Oxo Hannover Blanco tiles from Tile Warehouse provide a textural effect. Susie says the success of this project is down to an extraordinary amount of design time and close management of trades. But the real key was patience. “Although it was a hard slog, it’s made the result better. It’s also made us so appreciative of every little thing – like having door handles and a roof!